The name was created by Chris Ling in the naming contest on 14 Mar 2012. Hank the Intoxicator, the chapter 2 boss at the end of Part III: A Long Way Down of Chapter 2, is a giant contaminator with a flamer (instead of using poisonous gases). After entering the area, one can find some infestations around the oil tanks and in the area and would see the boss at the far end of the area. Hank would move around the area and aim at the player with his flamer. He may also throw some balls of infestations that do not give rise to kamikaze-caterpillars but remain fixed and damage and poison the player if he gets near them. No other mutants would come and help the boss even if his health gets low. Note that one can damage the boss during his evil laughter, unlike the chapter 1 boss, and the balls of infestations would explode when he laughs. 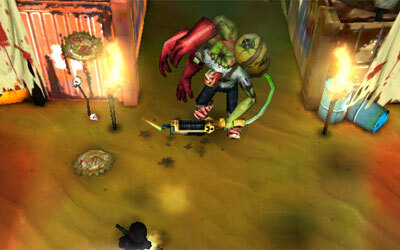 Before going for the boss, try to eliminate the infestations and the kamikaze-caterpillars in the area first. To deal with the boss, one should dodge the flames of the flamethrower behind the oil tanks and run around the area to avoid the balls of infestations because they poison and slow a player. If one get poisoned and burnt, he would get seriously damaged. 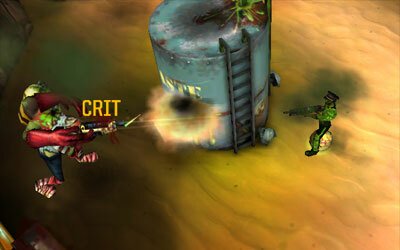 Try to hit the boss when he is laughing but watch out for the exploding infestations. If possible, you may stay on the edge behind an oil tank where your bullets can hit the boss but the boss cannot hit you with his flamer. I LOVE it. You, my friend, are awesome. Thanks! The screenshot is here. Hope you like it.